When self-doubt, fear, and anxiety take over, it diminishes our spirit. As such, we tend to seek comfort outside of ourselves to feel better…food, shopping, alcohol, etc. We are the Light of God, whole and complete just as we are. 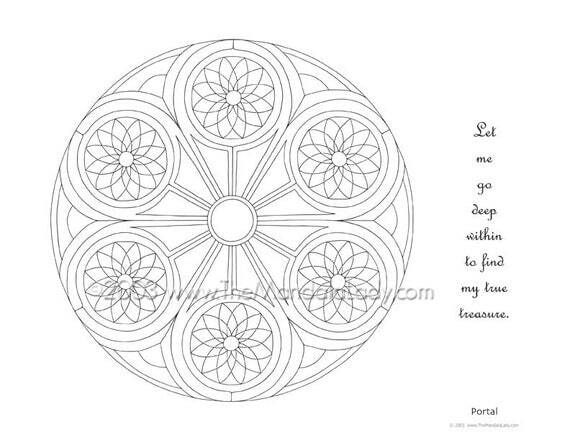 In exploring this idea, I received this mandala meditation idea on how to see and experience our True Selves. When I practiced it, this was my experience. It looks and feels like a giant, slow-circulating tornado, with all the energies coming from on high, down to this pin-point spot which feels like it’s above my head. It reminds me of just how vast and infinite we really are and that we have access to all that we need at any time…we just have to take the time to connect with it. Are You ready to experience Your True Self? Allow yourself 20-30 minutes of quiet time. The more you do this meditation, the quicker you’ll be able to do it. Eventually you’ll be able to do it in mere moments and in the most chaotic of times and places. If you have trouble visualizing…that’s okay…pay more attention to the sensations or essence of the experience. Again, this is more about the experience rather than being able to “see”. Make yourself comfortable. Do some deep breathing or whatever activity that helps you to be present in the moment. Now…Imagine that you are standing before a tunnel with a veil (1) draped over the entrance. When you’re ready, move the veil aside and enter the tunnel. Once inside the tunnel, look around. Allow yourself to just be in this section. Look around you. Across the way you see another veil(2) covering the entrance to the next section of the tunnel. When you’re ready to go on, move the veil aside and enter the next section. Notice that this next section is brighter than the previous one. Look around you. Across the way you see another veil(3) covering the next section of the tunnel. When you’re ready to go on, move the veil aside and enter the next section. Notice that this next section is even brighter than the previous one. Look around you…be present in the moment. Across the way you see another veil(4) covering the next section of the tunnel. When you’re ready to go on, move the veil aside and enter the last section of the tunnel. Notice that this section is even brighter still than the previous ones. Look around you. Breathe. Be present. Across the way you see another veil(5). You know that on the other side of this veil you can experience our True Self — whole and complete. Say to yourself again: I allow myself to see and experience my True Self in all its glory. When you’re ready, move the veil aside and enter the space of your True Self. Be here as long as you need or want to be. 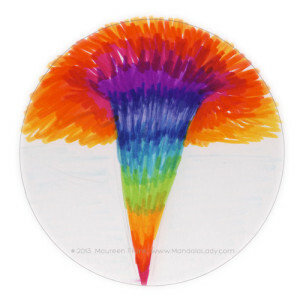 When you’re ready and as best you can, color/draw your experience into your mandala. When done coloring and before leaving this space, ask your True Self to share with you anything It feels you need to know at this time. Write it down or represent it somehow on your mandala. It’s now time to move back through the tunnel. As you go back through each section, you come back closer and closer to your full conscious, awake state…refreshed, renewed and more confident in yourself and who you really are. Turn back to the tunnel entrance, thanking it and your Higher Self for being there for you. Know that you can return to this place and your True Self at any time.